The Establishment Clause, which I discussed in last month's post, protects Americans against having to practice someone else’s religion. The Free Exercise Clause, on the other hand, gives Americans the right to affirmatively practice their own religion. This is an unconditional protection where beliefs are involved. Religiously-motivated conduct is a different matter. If one person’s religious conduct has no direct effect on others or merely inconveniences them, the government cannot prohibit the religious conduct. If the conduct places someone in jeopardy, that conduct must give way. 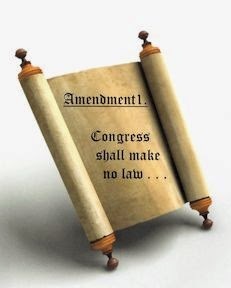 The Constitution protects the right to own a Bible, but it does not protect human sacrifice. Most people agree with this principal but disagree on where to draw the line between inconvenience and jeopardy. In most cases, however, religious conduct falls within the “inconvenience” category. If you want to pass out religious pamphlets on the streets, it may not make pedestrians happy. But as long as you take precautions against littering, there isn’t a lot the government can do to stop you. Let’s move to the school context. A teacher can’t assign an essay on the topic, “why Christianity (or Islam, or Buddhism, or atheism) is the only truth.” That’s forcing those with different beliefs to practice someone else’s religion. But the school also can’t discriminate against students who bring their own beliefs into an assignment as long as the student follows the assignment guidelines. Assume a Kindergarten teacher tells the members of her class to draw a picture of that child’s best friend so the teacher can post the drawings around the room for an open house. If one student decides his best friend is Jesus and draws a picture of a man hanging on a cross, the Free Exercise Clause requires the teacher to post it with the others. If a 9th grade history teacher asks his class to write a 500-word essay about George Washington, free exercise doesn’t give students a pass to write about Jesus instead. But they can write about George Washington’s relationship with Christ. In 1943 the Supreme Court said public schools cannot lock God out of the classroom,* and in 1962 it said they cannot invite him in. ** So what is a school’s job as an attendance monitor? To watch the door when God enters and see if He comes in with a student or a teacher. Because that makes all the difference. * West Virginia State Board of Education v. Barnette, 319 U.S. 624 (1943), struck down a law that required students to salute the flag. The Jehovah’s Witnesses believed that saluting anything other than God violated the second commandment. By striking down the law, the Supreme Court said, in essence, that students could bring their religious beliefs into the classroom with them. ** Engel v. Vitale, 370 U.S. 421 (1962), is the first case to strike down school-sponsored prayers. Words to warm a writer grandma’s heart. Perhaps some of my poor grandchildren have inherited the big ears that run in my family. Maybe I have passed on my poor map reading so that someday, they will end up in Cleveland, when the interview was in Chicago (hey, they both start with C). Most sentences don’t end with semicolons, no matter how local newspapers read. Restaurants whose menus offer hamburger’s and french fry’s should be closed by the Grammar Board of Health. “Laying down” often involves losing cash, whereas “lying down” involves a nice, soft sofa or bed and a brief vacation in Dreamland. The wiser choice is obvious. Slapping a, comma, in random, places, does not necessarily, a good, sentence make. Finally, spelling and grammar checks are our friends, but they can be sneaky. The best final check is one—no, two, according to Joey—done by exacting humans. And not that I’m prejudiced or anything, but he’s the smartest eight-year-old in the world. How about you? Any writer wisdom you hope to pass on to your family? Any perfect child/grandchild stories? Pictures? In addition to being a writer, I’m also a mother of three rowdy boys. I think the part of me that understands the concept of why a motherhood works is the same part that allows me to invest time in my writing, even through the craziness called life. There are similarities between writing and raising boys into mature Godly men. At the core, motherhood brings many problems, but a mother who spends time with their children every day, either through helping them with their homework, allowing a “date” night, or playing games, motherhood can be rewarding. You might not see the results right away, but over time, this little stolen moments where the children have your undivided attention can develop a deeper relationship between the child and the parent. As a mother, look for ways to build your children’s character up. Encourage them when they accomplish little tasks, such as gathering the trash, wiping the table after a meal, or earning an A at school. Overlooking the little tasks can be detrimental for a children’s growth. The more time you spend praising your children, the happier and closer your relationship with your children. In writing, it is important to keep reading a number of writing books to improve your skill. Using the advice of a mentor or a critique partner, your writing should improve by leaps and bounds. Like your relationship with your children, your writing will improve. Being a parent, sometimes you have to punish and correct your children when they do something wrong. Even though it hurts the parents as much as the children, parents who punish their children prove they care about the path the children are heading down and want the best for their children. Likewise, in writing, if you submit your manuscript without doing some extensive revision, then you’ll probably receive a rejection letter, which could hurt your feelings and give you the desire not to write ever again. You revise because you care about your final manuscript. You want the best to meet the eyes of the agents and readers, not a sloppy first run through. I love being a mother almost as much as I love writing. Investing your time in your work is such an important part of writing and approaching it like a mother armed to raise Godly children can be a lot of fun. I wish you all good luck with your writing as a “mother” to your current work in progress.